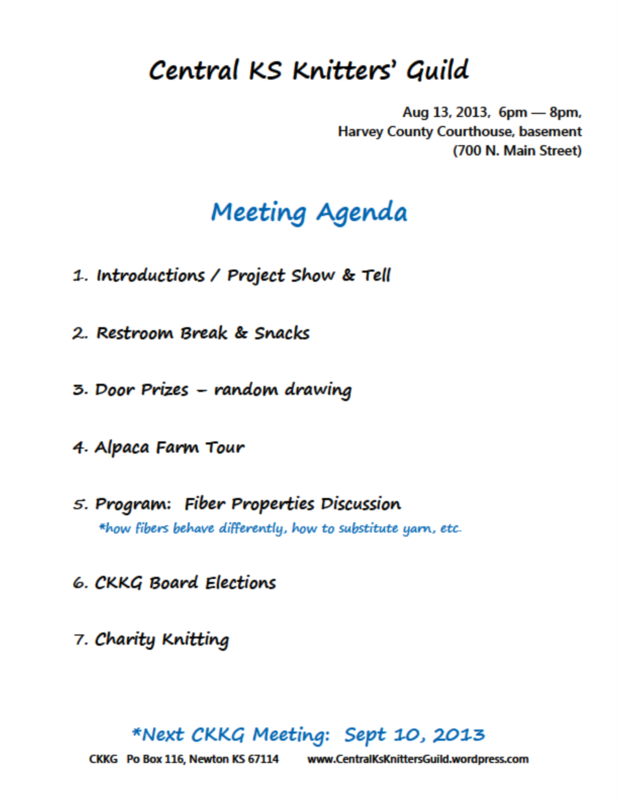 Grab your knitting and a friend and join us for the August Knitting Guild meeting! Tuesday, Aug 13th from 6-8pm at the Harvey County Courthouse (Newton, Main & 7th streets). *Check our Ravelry page for more information and carpool details. We have an exciting agenda, including photos from our recent Alpaca Farm Tour! Once again, it is time to hold our annual CKKG Board Elections. We have the 2 At-Large positions, one focusing on Education and the other on Membership. These volunteer positions require only a few hours per month (we have a Board Conference Call monthly & the meetings). If you are interested in helping, please email us! You can also add your name to the ballot at the meeting. Previous Previous post: Alpaca Farm Tour!